Wicklow firm Goldfish.ie has signed a €100,000 deal to provide telecoms technology to international company IDG Direct’s 100-person contact centre in Dublin. Since it launched in 2010, Goldfish.ie has grown its client base to include construction company John Sisk & Son; Perfect Card, the store card providers to shopping centres such as Dundrum Town Centre; and executive search company redtree Recruitment. IDG Direct is part of the International Data Group (IDG) a technology media, events and research company, whose services reach an audience of more than 280 million technology buyers in 97 countries. Its Dublin contact centre conducts research and sales lead generation calls to clients globally, in 27 different languages. Operating 24 hours a day from Monday to Friday, Goldfish.ie’s technology is now being used to make 15,000 calls a day to over 100 countries. 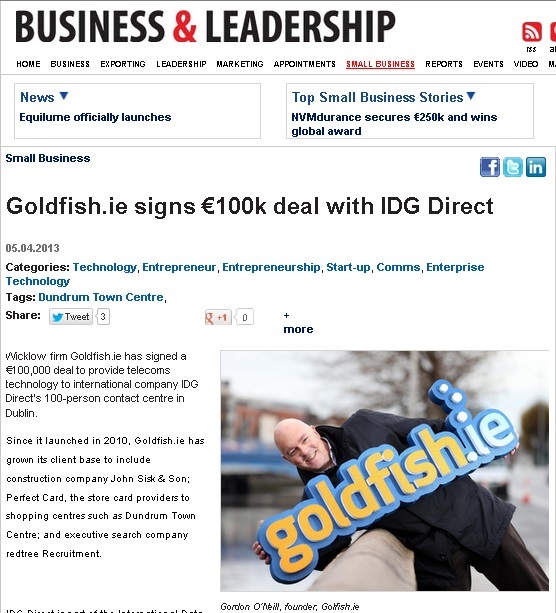 IDG Direct has also purchased Goldfish’s QuVu contact centre management system.